We brought the kitties home to the new house that was (almost) ready for them. Couples who are having children often prepare a room for the baby; we kitted out the mostly empty house as best we could for our little ones to arrive. We bought them an ‘activity centre’, two scratching posts (don’t want them destroying someone else’s carpet), beds, blankets, dishes, food, toys, litter boxes…more than most cats in this city seem to have. And at this point, they have more furniture and amenities than we have. And really, anything that is ours they can use, but it doesn’t work the other way; they can sleep on our bed but their beds aren’t much good to us! 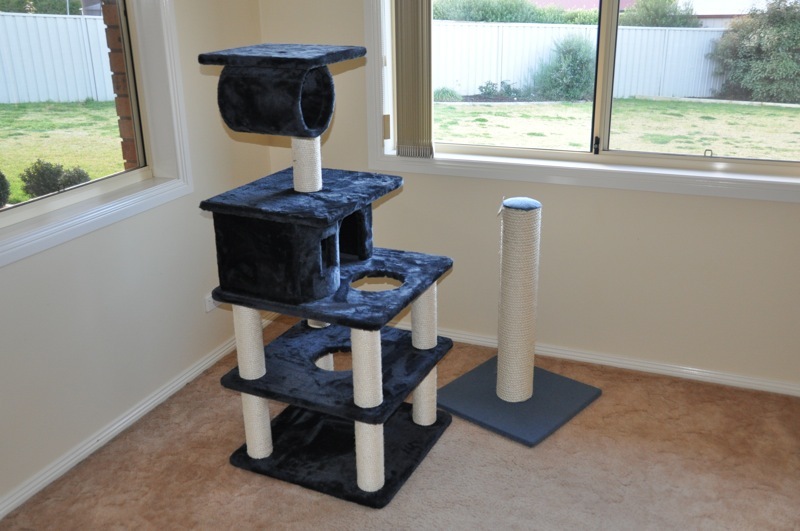 The kitties' new 'activity centre' (it really should just be called a sleeping centre) and one of the scratching posts. Shopping for them has been a bit of a challenge. There are three pet supply stores in Wagga: Petbarn, Bob’s Birdz-N-Pets, and Pets Plus and Aquarium, plus a section in Big W (owned by Woolworths, kind of like Wal-Mart); they all specialize in dogs, birds, and fish for the most part. Oh yes, and spiders; why you have to buy spiders in this country, when there are so many freely available, we don’t understand. Even the dog sections are geared toward animals that spend much of their life outdoors. The cat sections are pretty minimal. 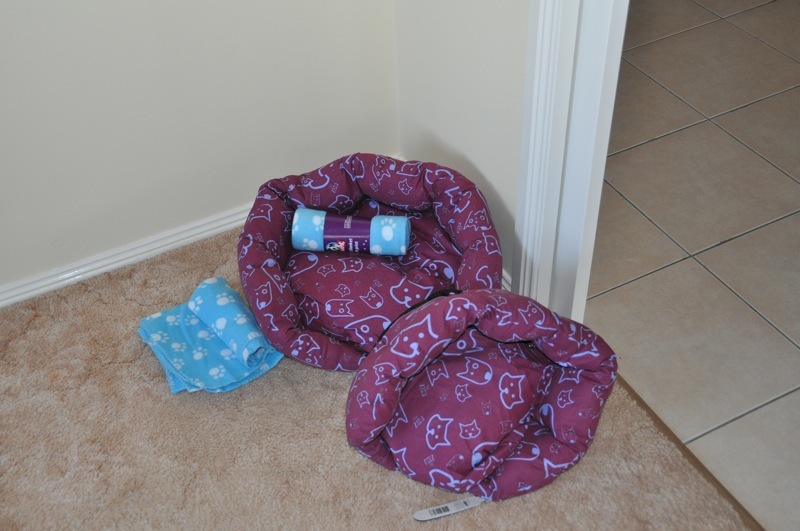 We had to shop at three of the stores to get just the items that we thought our cats would appreciate (tried Pets Plus and Aquarium too, but it is horrible…not much besides chook cages and fish). We reckoned that Qantas wouldn't provide snacks on a short flight, so had the water fountain flowing and food dishes filled for the cats' arrival. Some of their favorite items from Canada, we are working on replacing; others are in the sea can, sitting in port in Sydney right now. The cats absolutely loved their water fountain (a gift from Lisa’s parents and sister), but it wasn’t dual voltage; thanks to CB for giving our old one a good home! 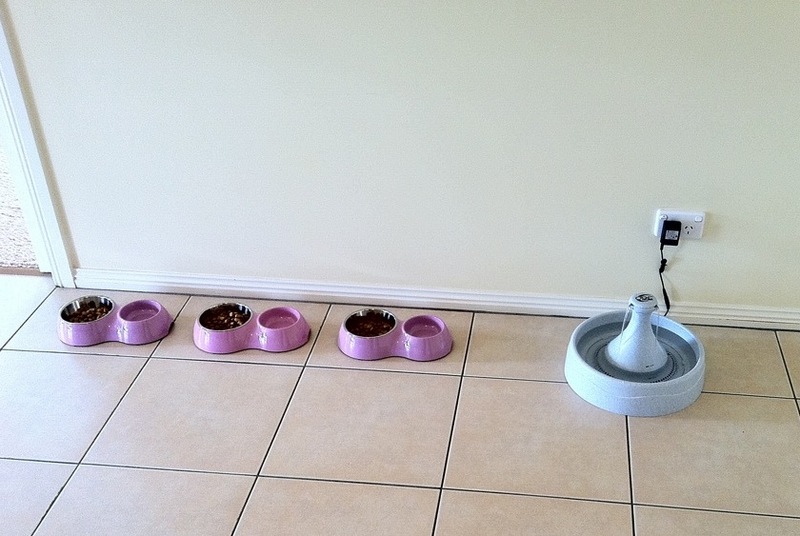 Nothing like that fountain could be found in Wagga, but an online store based near Sydney (Paws Point Pet Deli and Boutique) had the same one we had in Edmonton; they were out of stock, but said they would have it in a few days and send it our way. Just as we were about to get in the car to go collect the cats at the airport, an Australian postie (in a van, not on a motorcycle…that’s another cool post!) showed up with the fountain. This is important, as they actually like to play with their water while they drink. Another favourite toy is a big blue plastic ring with a ball stuck in it, that they batted around and around as they tried to get the ball out. It was about 18 inches in diameter – the ones we can find here are about 8 inches…Lester couldn’t lay inside it to play. Luckily, this one is on the ship. And the cardboard scratchers that Malachi honed his toes on are nowhere to be found. We will probably have to do some more online shopping (which Australia, being so spread out and with so many remote areas, does very well). 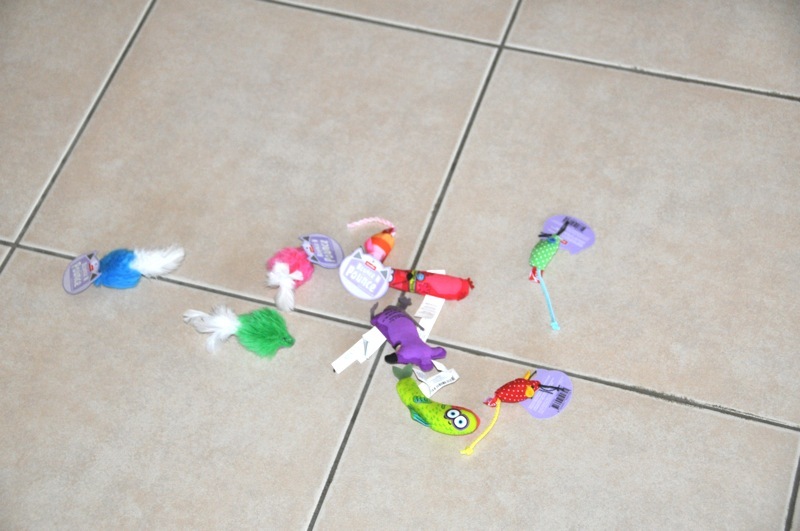 No, these aren't strange Australian bugs - just a whole mess of catnip toys. Food has been a bit of an issue too. We found a vet that sells their ‘prescription’ Hills T/D dental food. In Edmonton, we could buy it in 9 kg bags, which lasted quite a while. Here (not just Wagga but Australia in general), all we can get is 2 and 3.5 kg bags, and they are about 35% more expensive. And in Canada they ate Science Diet beef soft food; that isn’t available in Australia (because of worries about mad cow disease! ), so we have bought both chicken and turkey to see how they go (another Aussie saying…). Luckily, we were able to get the wood-pellet litter that they have used for years. It is much easier to deal with than clay, and much less dusty. It’s also environmentally friendly – compostable, biodegradeable, etc. If you’re a cat owner and you’re reading this, we encourage you to make the switch! In Edmonton, the pet shops sold it for about $20 per bag but we bought it at Rona, where they sold it as fuel for wood stoves at about $5 per 40 lb bag. Here, no such luck, we have to pay pet store prices. However, the good news is that the Aussies have perfected this approach to cat litter. We were able to buy “cat loos” designed for wood pellets, made by Oz-Pet. Our cats are now officially Oz cats. We bought some blankets and 2 cat beds - a 'single' and a 'double' - thinking that the boys would share the big one and Ellie would use the other one. We have now actually gone and bought a third one, because that plan just didn't work out. So now the kitties are adjusting to their new home, and we are adjusting to having them here. We’ll report on the adjustment next time, but for now, we will say that our bed isn’t big enough for all 5 of us (sorry Dan! Maybe you’ll have to curl up on the activity centre after all! ), and we have no other cat-friendly furniture. But we will get used to it, and hopefully we will have furniture (and the blue plastic ball toy!) soon. This entry was posted in aclimatizing, Australia, birds, Bob's Birdz-n-pets, cat litter, cats, cultural differences, food, pet supplies, Petbarn, spiders. Bookmark the permalink.